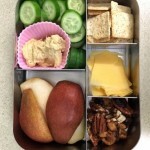 Do you find other people’s lunches interesting? I do, especially when they’re a source of new ideas for portable picks to pack and eat in my own lunch box. 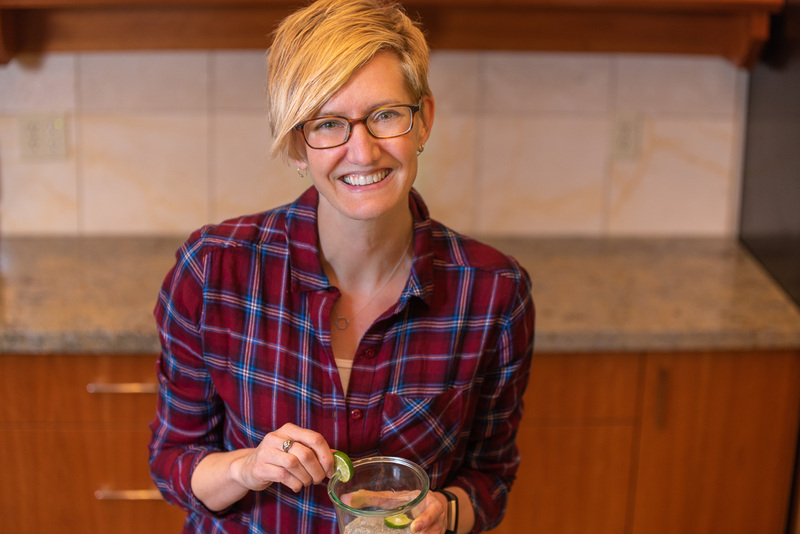 I click on links from the 100 Days of Real Food blog whenever they come through my Facebook feed because she shares pictures of her daughter’s lunches. 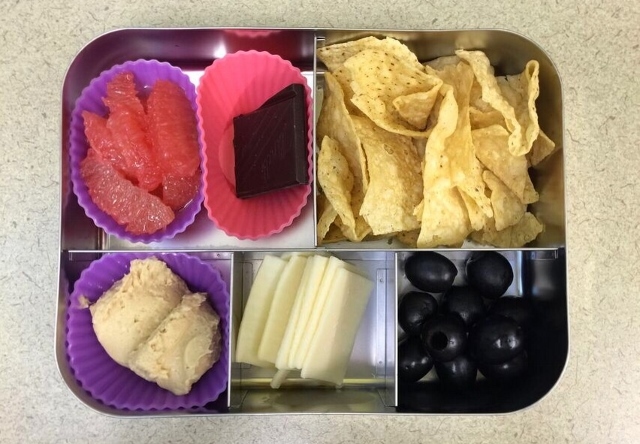 They’re not exclusively vegetarian, but often are, and she has the option to search for vegetarian choices on her school lunch inspiration page. She was one of the reasons I got a bento-style lunch box in the first place and I’ve been experiencing lunchtime satisfaction ever since. Her posts also gave me the idea to share my own lunch pics (see previous posts here and here). It’s been 6 months since my last over sharing of lunch details, and that was deep in the heart of summer. Santa got me a new LunchBots stainless steel food container for Christmas, so I’ve been filling it up every which way this cold and wet January. 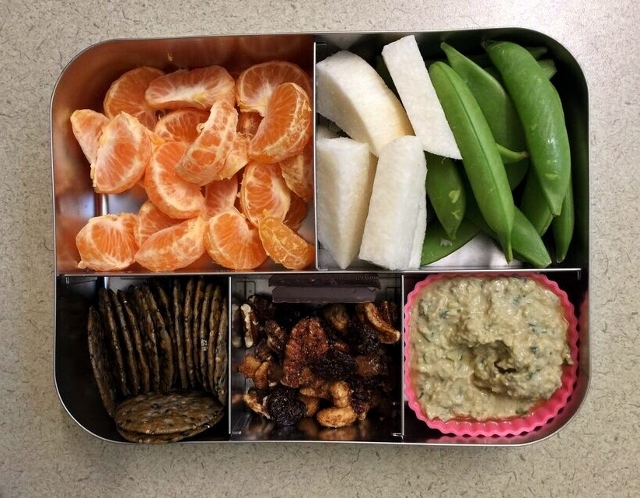 It’s my inspiration for today’s post: 7 Bento Lunches for Winter. Cold pizza. Cold pesto potato pizza. Cold pesto potato pizza cut into little strips for easier nibbling (from our local wood fire pizzeria La Fiamma). 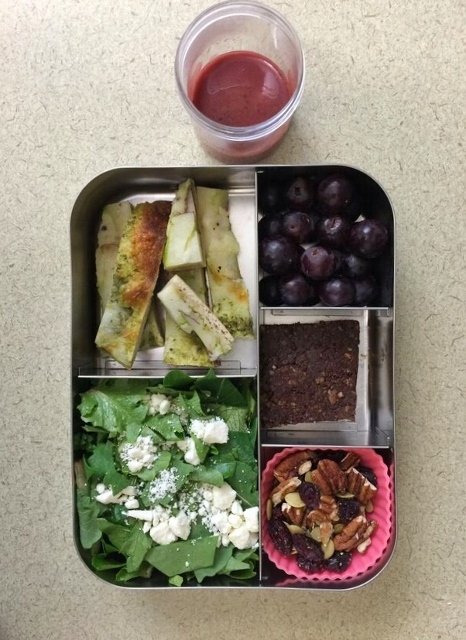 That was the basis for this bento, to which I added Cranberry Kale Salad with Roasted Pecans and Feta. I kept the crunchy toppings in their own compartment to minimize sogginess, and utilized a reusable muffin tin liner to make it easier to dump them onto the greens at lunchtime. (You may notice the cranberry dressing had to travel separately.) A few grapes and a Healthy Whatchamacallit Bar helped fill out all the spaces. This boxed lunch brought together a bunch of little tidbits of leftover food scattered around the kitchen, when it felt like there was nothing in the house to eat. I scraped up the last few tortilla chips in the bottom of the bag, the last lonely olives in the bottom of the can, and the last nub of mozzarella cheese. Luckily, I found one nearly-past-its-prime grapefruit and a couple of spoonfuls of hummus left in the tub. The square of Lindt salted dark chocolate rounded things out quite nicely. Sometimes even a dietitian gets a well-balanced meal. A red Bartlett pear (fruit) and a couple of those adorable cocktail cucumbers from Costco (veggies) started things off. 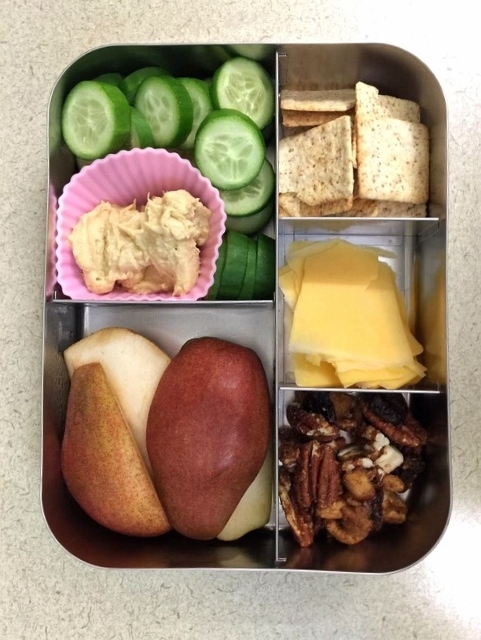 An ounce of sharp cheddar cheese (dairy) paired nicely with some whole wheat crackers (grains), while the 2 tablespoons of hummus and Sahalie Snacks Pecan Cashew Nut Crisp offered up a few bites of plant protein. Please excuse the less than perfect lunch pics. As you might expect, my options for food styling and lighting are somewhat limited in my campus office. The baby cucumbers are on board again, along with half an apple and a chunk of leftover Small Planet Garlic and Herb Baked Tofu. But what I couldn’t wait to munch on were my tiny sushi sandwiches. I followed this recipe and used peanut butter and honey on 3 pieces of Dave’s Killer Bread. The thin-sliced stuff is only 60 calories each. And for dessert, an unexpectedly good flavor combo: tamari almonds (2 tablespoons) and dark chocolate chips (1 tablespoon). When asked about my lunch one day, I explained to a coworker that I had celery with peanut butter for lunch, only topped with Craisins instead of raisins. He let me know this is fire ants on a log. So there you go. I suppose I’ve said before, but it never hurts to say it again: I use Adam’s Natural Peanut Butter or the Kirkland Signature Natural Peanut Butter to avoid hydrogenated fats and added sugar. 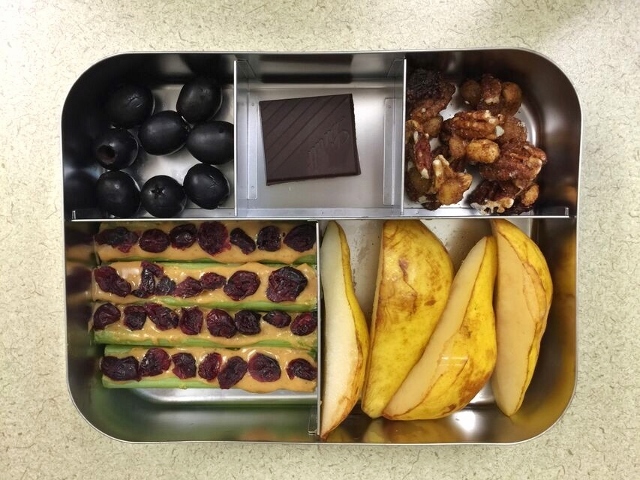 The rest of the compartments are a little plain, but still delicious: black olives, a beat-up pear, and 1 square of dark chocolate. This one seems a little blurry, don’t you think? Guess I need to bring a tripod to the office for more serious food photography. Hopefully with the description you can still tell what’s what. I started with this idea of apple dippers, and then expanded on it to round out the food groups by adding pretzels and celery too. There are two options for dipping: peanut butter and one of my favorite healthy Nutella alternatives, Justin’s Chocolate Hazelnut Butter. For crunch, I made a never before seen mixture of unsweetened coconut, mini chocolate chips, and homemade Holy Crap cereal. Get out the napkins, I think I’m going to make a mess with this one. If you pack right, you don’t need a microwave. That means you don’t have to politely wait in line while your coworker heats up their Lean Cuisine French Bread Supreme Pizza for (what feels like) 18 minutes, and you can just start feeding your face sooner. If you pack right, you don’t need silverware. Finger foods are where it’s at. Portion control is a given. Even if you want the whole bag of Chex Mix, it simply won’t fit. For the container pictured here, the three small spots each hold 1/2 cup and the 2 large spots each hold 1 cup. Portion control means calorie control. 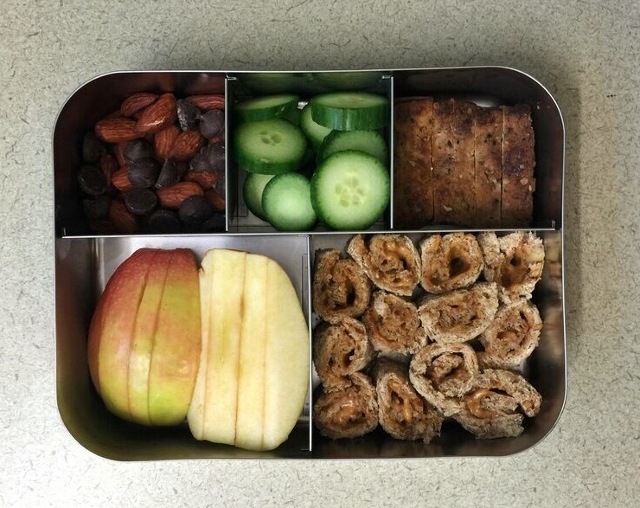 Bento #2 above is 470 calories and #3 is 560 calories. You’ll get motivated to use up leftovers. If my initial food choices only fill up 4 of my tiny compartments, I start trolling the deepest reaches of the refrigerator and pantry shelves to find something for space #5. 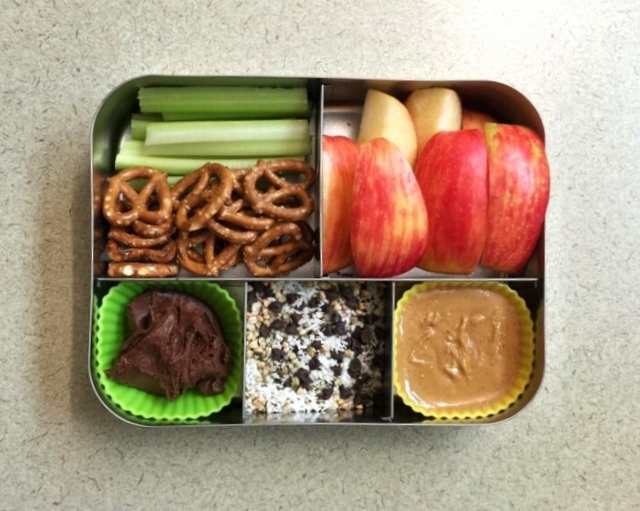 If you aren’t yet convinced that you should spy on other people’s lunches, go take a peek at Pinterest of course, but you can also troll food blogs, Facebook, and Twitter, or simply sneak up behind people in the lunchroom and peer over their shoulder. Whatever it takes for noontime inspiration. It certainly works for me. What do you do when you run out of ideas for lunch? Give up, get creative, or steal someone else’s idea?